The monument to the Jerry Rescue in Clinton Square. Most Central New Yorkers know about the Jerry Rescue, where a group of Syracuse abolitionists freed fugitive slave William "Jerry" Henry from jail and snuck him to Canada. 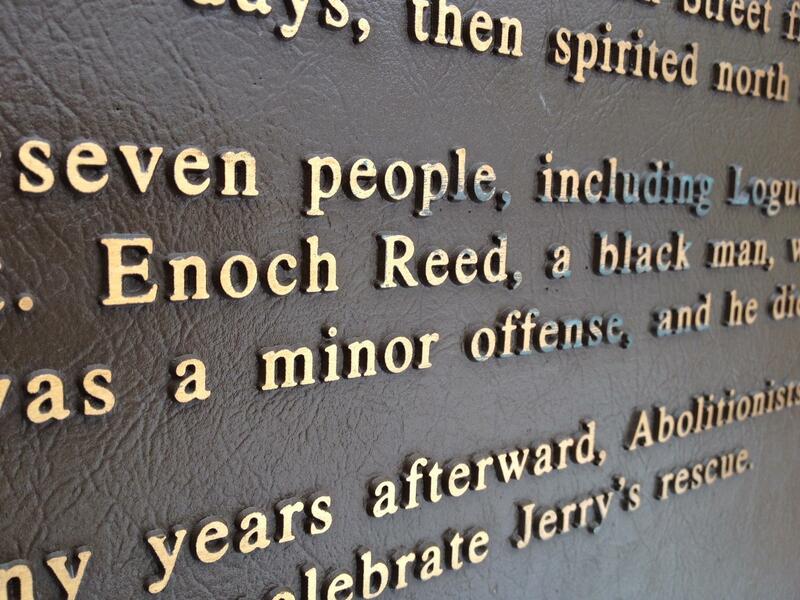 But chances are most don’t know the story behind Enoch Reed, one of the men who helped rescue Jerry in 1851. Onondaga Historical Association Curator of History Dennis Connors says to understand the significance of the Jerry Rescue is to understand that those involved were committing a serious act of civil disobedience. "This was something that, if they were going to right to disobey the fugitive slave law, was going to send messages right to the white house, right to the administration. And of course, they did do the rescue, and the [Millard Fillmore] administration reacted immediately. They said 'we have to prosecute these cases, we have to really show people that we mean business'." Connors says federal prosecutors handed down 19 indictments, and decided to hear four cases, the first of which was Enoch Reed’s. 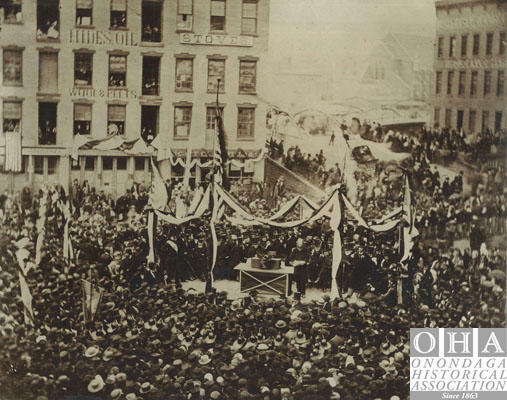 Hearings were held in Auburn, Canandaigua, and Buffalo…with the trial taking place in Albany in early 1853. Enoch Reed was the only one found guilty. "He was found NOT guilty of violating the fugitive slave act of 1850, but in fact violating a very early 18th century law, sort of along the same lines, but a much weaker law whose application in this case was even questionable." 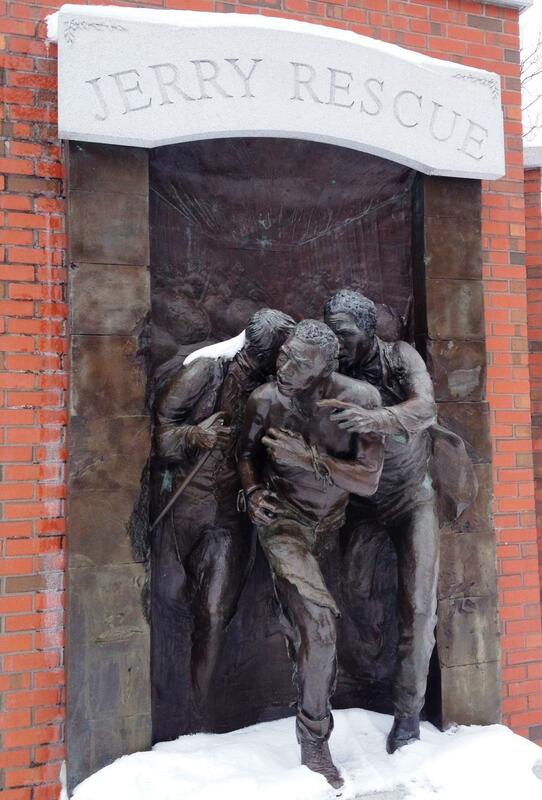 Reed's connection to the Jerry Rescue is included in the story on the monument. Reed’s attorneys appealed, but he died of illness later that year. In the end, Connors says prosecutors lost three of the four cases. "Eventually, the federal government said, 'it's obvious we're not going to get any guilty verdicts out of this,' and they just dropped the rest of the cases. For the abolitionists, this was a tremendous victory, because not only had they freed Jerry, they had been able to do it without any federal punishment." "He really sort of gave up his freedom for the freedom of a fellow African American." Connors says Reed’s short life is full of interesting circumstances that go beyond the Jerry Rescue. Listen to this edition of the story to learn more about the Reed's short but interesting life. The OHA has put together an exhibit telling the story of Enoch reed for the Syracuse Stage production of “To Kill a Mockingbird,” which opens this week. It was late the night of April 26, 1865 when President Abraham Lincoln’s funeral train made a brief stop in Syracuse on it’s way to the president’s final resting place in his home state of Illinois. Onondaga Historical Association Curator of History Dennis Connors says that spring, many families were reeling from the civil war. Thousands of men from Onondaga County had volunteered to fight. When my friend Theresa Constantine told me how she'd signed up as a tour guide for the Onondaga Historical Association's walk through the Hotel Syracuse set up for the last weekend of 2014 and asked if I'd like to tag along as her back-of-the-pack support, I jumped. Remembering Harper Lee, Who Died Days Before Syr Stage Opens "To Kill A Mockingbird"
Syracuse Stage has an unfortunate note of nostalgia added to its production of “To Kill a Mockingbird” that opens this week. The passing of Harper Lee who wrote the novel has caused some reflection on the story and its characters.